The AAF has arrived, and the product was surprisingly entertaining. That’s especially true if you were able to find your way into an AAF fantasy football league or DFS contest. 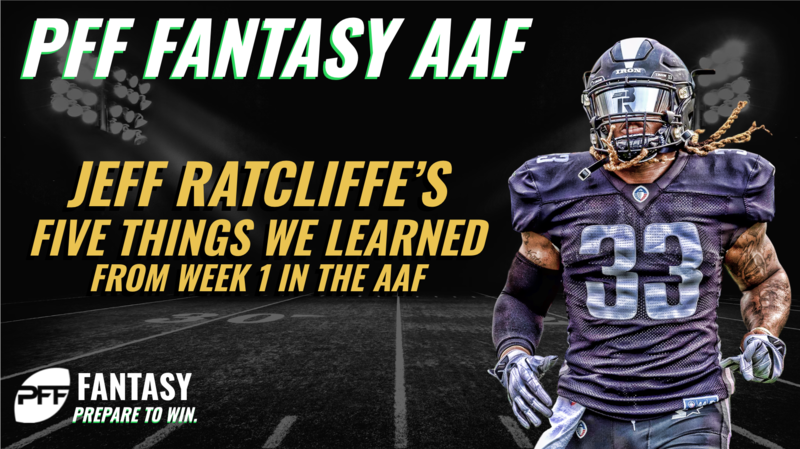 Just like we do with the NFL, we’ll be diving in deep with AAF fantasy coverage including recaps, rankings, and other content on the league. To kick things off, let’s take a look back at five things we learned from the four games from this past weekend. He’s one of the biggest NFL fantasy disappointments of the last decade, but Richardson was widely considered the top fantasy pick in AAF drafts. Surprisingly, he didn’t disappoint in Week 1 thanks to two rushing scores. However, it wasn’t the most efficient day for Richardson, as he managed just 58 rushing yards on 23 carries and lost a fumble. While 2.5 yards per carry doesn’t instill much confidence, volume is king in fantasy football. Richardson has very little competition for carries in the Iron backfield, with Ladarius Perkins being the only other running back to get carries in the opener. Perkins saw five carries but was used more heavily in the passing game, with six catches. It may not be pretty, but Richardson is shaping up to be a rock-solid RB1. While many thought Trevor Knight would be under center for the Hotshots, it was actually John Wolford who earned the starting gig. After Week 1, we can see why. Wolford was the highest-graded quarterback for the week and led all signal-callers in fantasy scoring after tossing four touchdowns to go along with 275 passing yards. Wolford also chipped in 23 rushing yards. But it wasn’t just Wolford who racked up fantasy points. Hotshots WR Rashad Ross led all non-quarterback skill position players in fantasy scoring with 27.3 points. Ross caught 5-of-7 targets for 103 yards and two scores. More impressively, Ross saw four contested targets and caught three of them and had an average depth of target of 23.4 yards. Those numbers bode well for continued fantasy success. Ross has to be considered one of the top AAF fantasy wideouts going forward. Memories of the greatest show on turf got a lot of folks fired up about the Fleet offense under Mike Martz, but Week 1 showed that San Diego has a long way to go. Mike Bercovici struggled for much of the game, completing just 60% of his throws while taking six sacks and tossing two interceptions. Bercovici was the first quarterback off the board in a number of AAF fantasy drafts, but the initial impression suggests that at best he’s a middling option. He outscored just two other starting quarterbacks for the week. Just like the NFL, your fantasy options are going to be limited at tight end. Gerald Christian of the Hotshots led the position in fantasy scoring for the week with 13.4 fantasy points, but he did so largely because he was one of just two tight ends to find the end zone. Nick Truesdell of the Salt Lake Stallions was the other, and he finished second in fantasy scoring for the week. So, unfortunately, tight end with likely be a hope-for-a-touchdown position just like it is for 95% of NFL fantasy tight ends. However, Truesdell’s teammate Anthony Denham is somewhat intriguing after he led the position with seven targets for the week. Denham racked up five catches for 59 yards, both of which also led tight ends for the week. 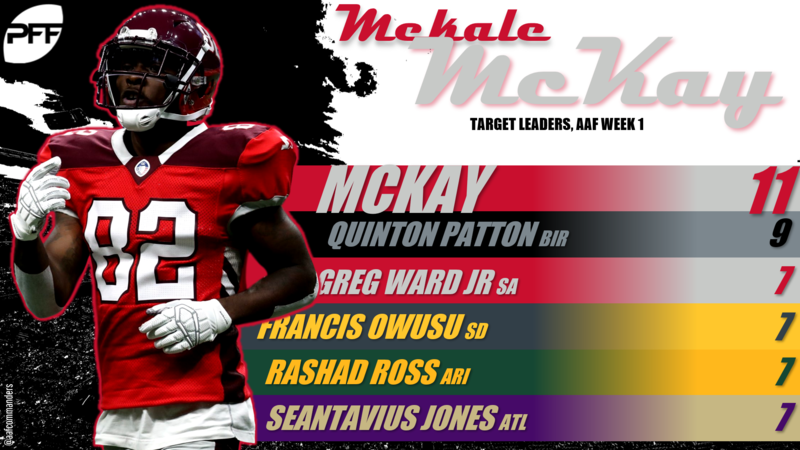 Only one player topped double-digit targets for the week: Mekale McKay of the Commanders. McKay saw 11 targets and caught five for 80 yards. Those totals could have been higher, but McKay did have a drop. Only two players topped 100 receiving yards: Quinton Patton and the aforementioned Rashad Ross. And neither player did so due to heavy catch volume. Ross caught five balls, and Patton managed just four catches. That being said, Patton did see nine targets. Like McKay, he didn’t do his quarterback any favors with three drops, but his target volume does bode well going forward. In terms of catches, Greg Ward Jr. and Richard Mullaney tied Ross, McKay and San Diego’s Brian Brown for the lead with five apiece. Neither player put up big yardage numbers, but their workload makes each appealing in PPR scoring.